New World Interactive’s Day of Infamy may have begun its life as a mod of Insurgency (itself originally a mod of Half Life 2), but it has blossomed into its own project entirely. Recently entering beta, the game shows a surprising amount of polish and direction, taking the gritty realism of Day of Defeat and cranking it up a few notches. Though it still could use a few more maps and a fair amount of balancing, there’s enough game here to warrant the usually dreaded Early Access purchase. Strictly a multiplayer experience, Day of Infamy takes itself incredibly seriously. At the beginning of each match, players can choose from an array of class types, including some classes that are rarely, if ever, included in many games. For example, there’s a Communications soldier, who is in charge of carrying the team’s radio to battle. This player is encouraged to stick close to the team’s Office, who, utilizing the Communications soldier’s radio, can call in artillery strikes. Class combinations such as this encourage an unusual level of teamwork and communication and this level of depth will undoubtedly scare of less serious players. Teams are limited to just a few of each class, the Rifleman notwithstanding, so teams can never get stacked with Snipers or Machine Gunners. While the game can become frustrating (it’s a tough game), it’s never due to constantly being sniped or gunned down by a plethora of overpowered machine gunners (hello Battlefield). Graphically the game looks dated, at best. Running on an old engine will do this, and seeing as how this is a low-budget game, I don’t expect to see the Source engine updated the way it was in something like Titanfall. Of course, this can have it’s benefits, especially in indie multiplayer games. 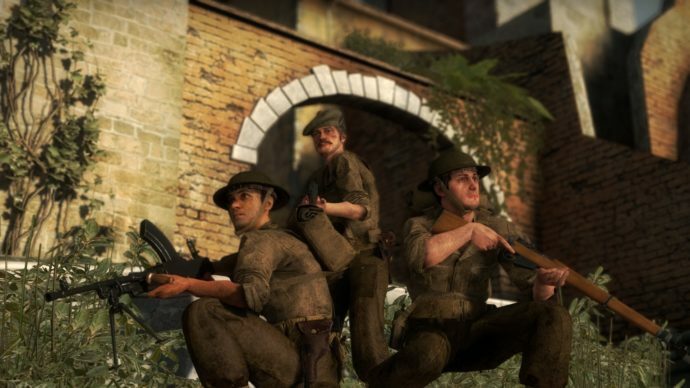 Surely, Day of Infamy will run on some of the more outdated systems, but for those of us with beefier rigs, I can’t help but wish it looked better. Corners look too sharp and holes in the walls are jagged, and because these graphical inconsistencies work to pull you out of the experience. This is a video game, and you’re reminded of that fact routinely. Worse off are character models. They appear to have some features ripped from more modern games. They have relatively smooth features, and fewer harsh edges. Then there are the eyes. My God, the eyes. I’m not sure if New World Interactive is trying to get that thousand-yard-stare look just right, but if that’s what they are going for… bravo. That character selection screen will likely haunt your dreams for days (Note: There are mods that fix this). But when it comes down to it, you’re playing Day of Infamy because you’re looking for a very specific experience, and it’s likely in today’s landscape of modern shooters and open-world RPGs, if you’re looking for a relatively realistic World War II shooter, you’re starved for something new. Day of Infamy might just be the game you’re looking for. While it doesn’t do a lot to separate itself from Day of Defeat, it’s most attractive feature is that it takes that formula and adds a few more things. There are a number of different modes, for example, and the aforementioned classes and reliance upon communication. Nothing groundbreaking, mind you, but a lot of minor additions that ultimately work together really well. I haven’t even mentioned the outstanding sound design, which feels the most “next-gen” of anything in the game. When other players speak, you can only hear them nearby, and when they’re far away, their voices sound appropriately distant. When planes fly overhead, it’s panic-inducing, just as the sounds of mortar fire coming down on your position. These aren’t sounds you’ve never heard before, but in the heat of battle, it uniquely intensifies the experience in ways that few games utilize sound. Before the official release, Day of Infamy is in dire need of balancing. It’s incredibly difficult on some maps for some teams to get an upper hand. It got to the point where my team was cleaning up in minutes. Additionally, if you play as a Nazi in the first round, expect to play as a Nazi the next. It doesn’t make sense to force players to experience just one side of the map. Lastly, before release, New World should also release additional maps. The current lot of six is by no means a bad number, particularly for the scope of the project, but WW2 was a massive war, and leaves a lot of potential locations to explore in the future. Day of Infamy is undoubtedly a good game, with the potential to be great. This is why Early Access exists – it gives us the opportunity to experience the development of a game without all of the bugs that so commonly plague Early Access games. This is one to keep an eye on.